Hosted by the UAE and convened by HRH Princess Sarah Zeid (leading the Global Strategy‘s EveryWhere workstream), this forum brings together technical experts from diverse sectors to explore options for supporting effective implementation strategies and approaches, fostering needed research to address gaps, prompting greater private sector engagement, leveraging development-humanitarian funding synergies, encouragement and alignment of additional investment streams. The primary output of the meeting will be advice for a five-year strategy for implementation of Every Woman, Every Child Every Adolescent, EveryWhere. 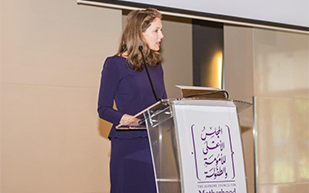 Below is the opening statement of HRH Princess Sarah Zeid on April 4, 2016. Your Excellency, thank you for your remarks and kind introduction. First and foremost, I would like to express my heartfelt gratitude and appreciation to HH Sheika Fatima bint Mubarak. It is our great honor to have HH’s continued patronage, and to be guided by HH’s inspirational leadership and determination that women, adolescents, children and newborns in each and every setting – no matter how difficult, hard to reach or complex their need—not only matter, but they must be our priority. Since its inception, the humanitarian work stream of the EWEC Global Strategy—or as we are known now EWEC EveryWhere—has been a dynamic and substantive partnership with the United Arab Emirates. The UAE Mission to the United Nations in NY is amazing! HE Ambassador Lana Zaki Nusseibeh has leant her unwavering support to the goals of EveryWhere, and challenged us to do more and do better at every step. It is a great privilege to work closely with the Ambassador’s outstanding team. The Ministry of Foreign Affairs and International Cooperation has engaged us and enabled us—including by supporting EveryWhere’s profile and influence at the World Government Summit in Dubai earlier this year. The global orientation to the Sustainable Development Agenda at the Summit and pledge to be an annual recorder of SDG progress was a greatly needed and bold start to the era of the Global Goals. I am delighted to have the honor this morning also of recognizing and thanking the Director General of the Abu Dhabi Health Authority, Professor Maha Barakat. Dr. Barakat spoke powerfully at the World Health Assembly and was a co-author of a Commentary in The Lancet in May 2015, in support of the Abu Dhabi Declaration and of the validity of the reasoning behind our call to put women, children, newborns and adolescents first everywhere. It is to HE Rym Al Falasy, Secretary General of the Supreme Council for Motherhood and Childhood, and her fabulous team, that we truly owe thanks for their unrelenting tolerance of our disruptive ways and demands! HE’s deep conviction that no matter the circumstances, preventable human suffering is unacceptable, and her understanding that a global approach is key in transforming of the lives of women, children, newborns and adolescents, has been our enabler and our assurance. And all of you! I am so proud and excited that you are here! We are an extraordinary gathering of more than 30 different organizations, UN funds and programs, donors, experts and NGOs. To those of you who have been on this journey from the start—thank you. The leap of faith you took at the outset was the making us, and to those who have just arrived—be warned—there is no escape! For across the humanitarian and development divides, strategically linking our many locations, focusing our different themes, convening our diverse expertise and multiple mandates, EveryWhere consolidates what we share in common—the ambition that geography not deny women and children essential services, that crisis not masque constant need for sexual and reproductive dignity, that disaster not excuse our collective failure to do what is needed, what is essential and what is rightful in all settings. You may have noticed that when I talk about EveryWhere, and I speak as “we” and “our” —it is because EveryWhere is the creation, product, and result of hard work and determination of the very best team: Breshna Orya, Anita Sharma, Rajat Khosla and the awesome Kate Gilmore. They have worked, written, battled and been magnificent in every setting. EWEC EveryWhere began its journey in the UAE just over a year ago. The resulting Abu Dhabi Declaration was an unprecedented call to action for reproductive, maternal, newborn and adolescent health in fragile and complex settings, whose first purpose was the formulation of a humanitarian pillar for the renewed Global Strategy for Women’s, Children’s and Adolescents’ Health. The power of EveryWhere’s voice has been heard throughout the year in part because of the confronting reality it asserts. Namely that fragile and complex settings are where the greatest risks to maternal, adolescent, child and newborn health are found, and it is there where the need for policy and operational innovation is greatest, and where new ways of working and partnering—to deliver better results for those who have the least—is most pressing and most urgent. Because of the work we did together here, the renewed Global Strategy, launched in September alongside the Sustainable Development Goals, acknowledges the dramatic impact of “settings” on prospects for women’s, children’s, newborn’s and adolescents’ health and well-being. It introduces a call for greater integration between development and humanitarian actors; targeted investments in multi-hazard risk assessment and emergency preparedness; integration of disaster risk reduction into national health plans; and, renewed efforts to enhance transition from humanitarian settings to sustainable development. It was ground breaking change then, and it is ground breaking change now. We did this. And we did more. Over the course of 2015, EveryWhere transformed the Global Strategy’s overall approach. We forged new alliances, challenged the approach of the key EWEC funders—including the World Bank! We brought together Pacific Islands Ministers of Health in the lead up to the global climate change negotiations and delivered the first ever Pacific-wide statement on the position of women, adolescents, children and newborns as assets to climate change adaptation, emphasizing the strategic importance of their health, well-being and dignity. In other words, together—through EveryWhere—we took what was even less than a mere glimmer of a twinkle in our eyes, and we have shone a beacon of hope and of determined aspiration! And throughout our process, I am very proud to say that we have stuck fast to our principles. Transparency, openness, participation, diversity! Doing our very best to congregate not complicate. To cohere not to duplicate. To enable—to speak frankly and not to self-censor, and always—always—keeping women, adolescents, children and newborns at the center. This year as the Global Strategy for Women’s, Children’s and Adolescents’ Health moves from strategy to delivery, EveryWhere is poised to drive further significant impact. We are ready to advance knowledge, to converge, where needed, greater cooperation and encourage more strategic collaboration. We are ready to strengthen policy coherence, innovation and sharpen advocacy. But this is only because we have an ultimate destination from which we will not be diverted: and that is the protection of, the access to life-saving healthcare for, and the enduring dignity of all women, adolescents, children and newborns everywhere—including those living in the most vulnerable of circumstances and at the toughest of times. And these are tough times. More people are on the move in flight from conflict, poverty and oppression—75% estimated to be women and children. There is greater xenophobia where there should be greater compassion. There are more bombs where there should be more aid. More suffering where there should be more relief. There is such great need. We feel it. There is so much beyond our reach. We know it. There is so much out of our control. We are aware of it. But not this. This we can do. This we can change. To this we can make a tangible difference. The health, well-being and dignity of women and their children. Together, we can make the transformation they so urgently need. Together, we can make the change to which they are so deeply entitled. And that is precisely why we are reconvening in Abu Dhabi. So now I am going to ask you to do it all over again. I am asking you to come into this room, bringing your very best: your expertise, experience, imagination and your most urgent audacious determination. I am asking you to leave outside the room—your agency’s interests, its brand, your origins and politics, and focus only on the task at hand: how can we best reach those who need us most? That with quality, accountability, efficiency and urgency we can better uphold their rights and forge with them a partnership for their and their community’s resilience—without which we all surely will fail. Dear friends, for the first time we have the opportunity to target, plan and programme for the health and dignity of women, adolescents, children and newborns across the entire continuum of care—across the full life course—and for relevance in every setting – be it affected by crisis, conflict, contagion or climate change. This is what we have made possible and this is what we must now make a reality. We can and must ensure that the interests of women, children, newborns and adolescents, are at very forefront of those global dialogues. That their dignity is the golden thread linking those conversations and the impact for them is the test of those efforts’ value. I fundamentally believe that when we set our minds to audacious, magical, seemingly impossible ideas and then through expertise – science, technology and collaboration—set about bringing those audacious goals to reality—we can set change on fire. It is up to us to do it. It’s up to us how far and how hard we push, how high we aim. This, my friends, this is our moon shot.